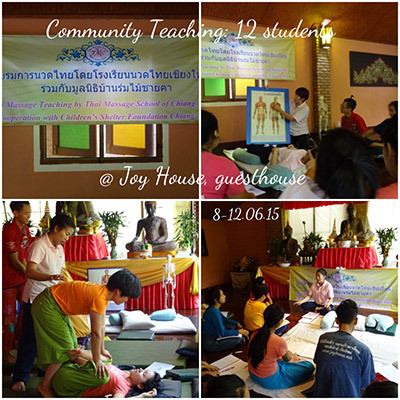 Teacher training program: GCT300 Hour Program teachers are required to teach real classes, 12 hour Foot Reflexology and 30 hour Foundation of Thai Massage to community students. The training site can be in-house or at the community centers. All class performance and setting, workbooks, tools are the same like what students would learn from a paid TMC class program. GCT teachers perform their teaching role according to the training, planning and class outline like a professional. All students perform well and earn their diplomas. Some will apply toward their massage career. Some will use the skill for the family. Some learn for fun. We look forward to build more bridges to expand knowledge with true teachers. Join us if you have in your heart the urge to give-to share with the world.